Fished the river yesterday. Only managed a couple of trout and a red fish, all throwbacks. The red was really pretty though, real coppery color. Not a lot of boats on the river. Took us all morning, but we finally found 'em. Tried lots of spots down river, near 4-mile creek, up East River, etc. The farther we went toward the lighthouse, the more the water temps dropped. 59 at the fort, 54 degrees by marker 14. Went up to the powerplant and all we caught were little sand trout. Finally we turned up the Wakulla river -- water temps 63 to 64 degrees by the time we got to Shell Island fish camp. So the trout were hanging out in 7 feet of water between the point at the fort and the park (before you get to Shell Island). One other thing we figured out -- white gulps and dead shrimp weren't doing it, and none of the shops had live shrimp; but gulps and mirrolure softbaits in new penny or metal-flake maroon were the ticket. Slow retrieve on a jighead without the cork, or on a jighead 4 feet under a rattling cork. Nice work, guys. Glad you found some and on fly, too. I was down there working on my steering project. Turned out to be a decent day. Forecast is even better for tomorrow and next week. Even saw some pine pollen today, a sign of spring. Fished Sunday and got skunked. Threw gulp and twitch baits. Water on flats was 53. 61 in Spring creek. I fished east of the lighthouse both Sat and Sun. The water temp increased from 54 on Sat to 58 on Sun. I was also east of the Lighthouse Sunday, kayak fishing both sides of the morning low tide. 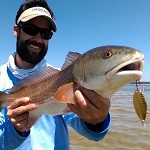 Decent reds and trout action, and lots of bait in the water. Using my legs as thermometers, I'd call the water temp mid-50s. GaryDroze wrote: I was also east of the Lighthouse Sunday, kayak fishing both sides of the morning low tide. Decent reds and trout action, and lots of bait in the water. Using my legs as thermometers, I'd call the water temp mid-50s. I fished Stoney briefly both Sat and Sun while waiting for enough water to go farther east. Boy that place has gotten crowded over the last couple year. Saw kayakers, a guide and a couple other boats both days. I'm pretty sure one of them was you on Sunday. Not too many others fish from shore with a bait bucket. It was a little windy to use the fly rod Sat so we stuck with spinning tackle. Did decent on the reds that day. Sunday was much calmer so I was able to break it out for a few until the gnats became unbearable. Caught a good number of reds but was also happy to see a few quality trout and SH mixed in. Last edited by tailwaters on February 5th, 2019, 9:45 am, edited 2 times in total. tailwaters wrote: .... until the gnats became unbearable.